A little bit sweet, a little bit smokey. These Chipotle Raspberry Chicken Enchiladas are a fresh take on your typical Tex Mex fare. 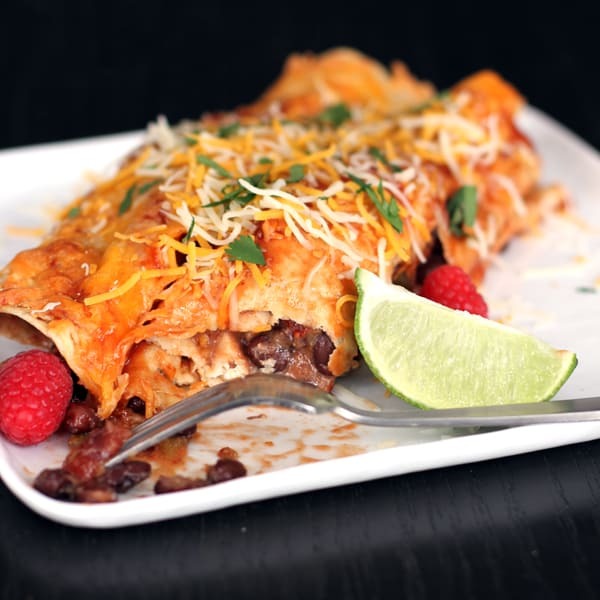 Served with your favorite toppings, you’ll have dinner on the table in less time than it would take to order enchiladas at your favorite restaurant. I don’t have a tried and true enchilada recipe. Wait. Strike that. I do now but I didn’t before. 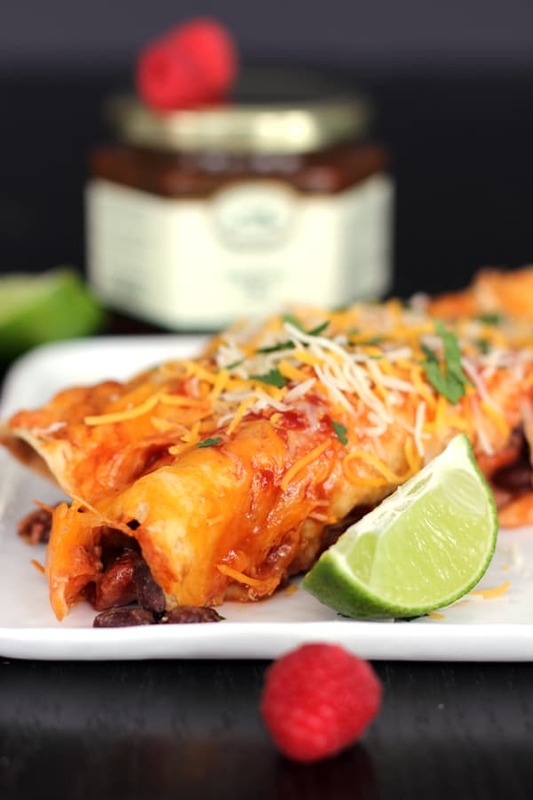 And these aren’t any ‘ol enchiladas, these are a bit sweet, a bit smokey and a whole lot of delicious! My key ingredient? The one that makes this Tex-Mex main dish come together in no time? Robert Rothschild Farms’ Raspberry Salsa. A key component to the enchilada filling and used as a replacement for enchilada sauce, it lends it’s sweet, tangy flavor easily to this dish truly making it one of a kind. 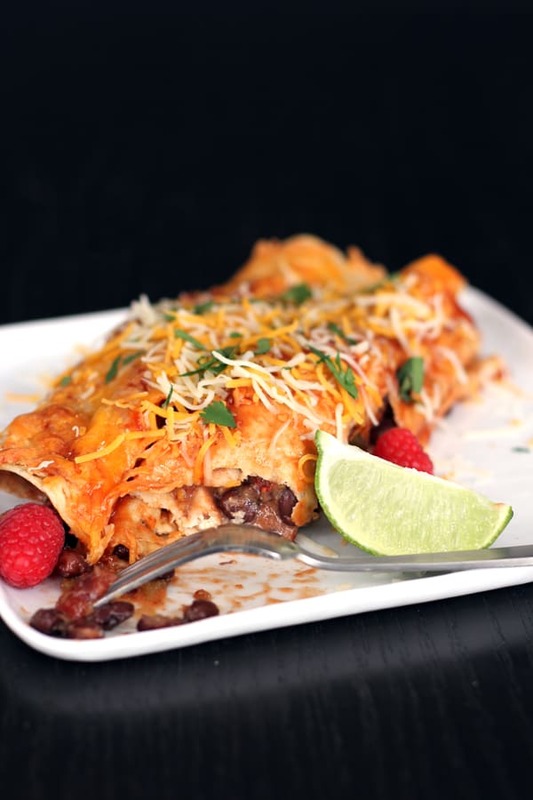 You can easily make a whole pan of enchiladas in the time it would take you to be served at your favorite restaurant! And what would an enchilada be without a little heat? Or in this case, without a little smokey flavor? I’ve added not only a couple of minced chipotle peppers but some adobo sauce as well. The result? Sweet and smokey and absolutely out of this world! If you’re not a fan of heat, never fear! All three of my children ate these without any complaints or talk about anything being spicy. And believe me, if she would’ve thought there was one minute chance of these being hot, my five year old would’ve balked at the thought. She doesn’t do spice. In a large bowl, stir together one jar of salsa and all other ingredients EXCEPT tortillas. In a 9x13 pan, pour 1/2 cup salsa and spread evenly covering the bottom of dish. For each enchilada, pour 2/3 cup of chicken mixture down the center of a tortilla. Fold both ends of tortilla over filling and place seam side down in prepared baking dish. Pour remaining salsa over top of enchiladas. Cover enchiladas with cheese. Bake for 20 minutes or until cheese is beginning to brown and enchilada filling is bubbling. We served our enchiladas with cilantro, plain yogurt, extra shredded cheese and a squeeze of lime but definitely choose your favorites to make them your own! I was compensated by Robert Rothschild Farm to create a recipe featuring their product. As always, all thoughts and opinions are my own. I'm SO happy to have found your blog and this delicious looking recipe at the Saturday Night Fever link party! You're so kind, thank you Becca! Thank you so much for stopping in at Simple Supper Tuesday! Thanks for the invite, Cindy! 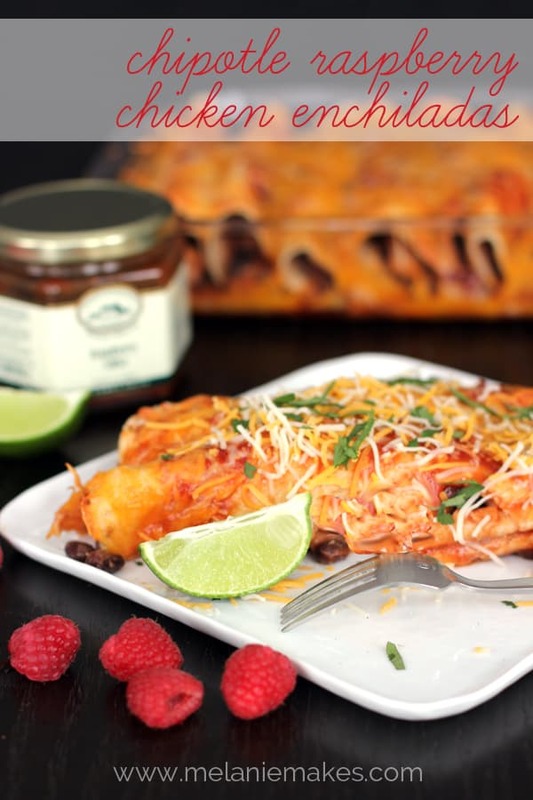 Raspberry with Enchiladas??? How did I not think of this. I love Mexican food. This looks amazing. Found you on the Weekend Re-Treat! This recipe looks fantastic but the salsa is $9.99 a jar, At $20.00 for the salsa alone it's a budget blower for me, do you have any other more ecmonical suggestions to replace the salsa with? Hey, Lynn -You could try and replicate the flavor by combining crushed fresh raspberries with a jar of salsa you'd typically by. The salsa that I used is pretty sweet which lends itself to working well with the chipotle. I will say that this recipe makes 10 enchiladas and I'd guess most people would only eat one if served with sides so the math equals to about $1 a serving. Hope that helps! These look delish! 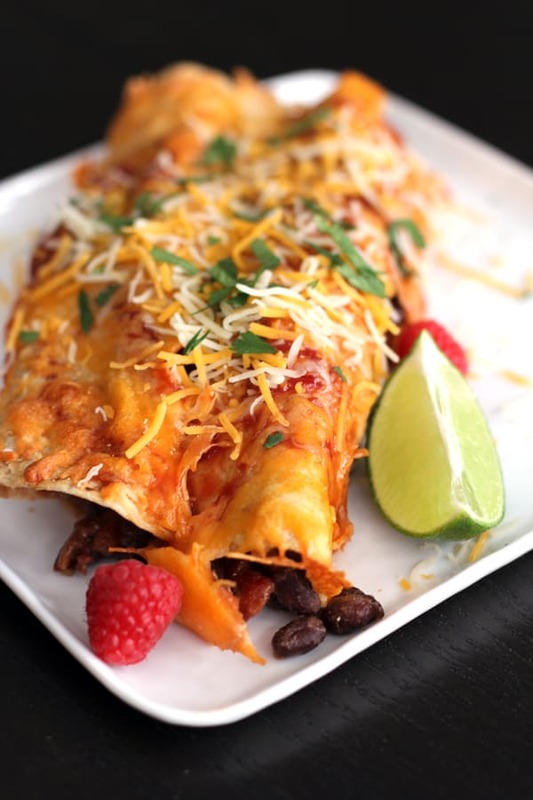 I was just about to make some enchilladas for the boys next week so maybe i'll try this recipe! I love that these look so light and healthy...often times I turn my nose up at Mexican food because it can be so fried and heavy. Thanks for the idea! Yes! And I also used whole wheat tortillas in ours which was a healthier choice as well. Let me know if you give it a try!